Anthea Nicholas made headlines last year when, at 50, she became "Australia's oldest mother to conceive naturally". Anthea Nicholas and Peter Byrnes, who married in September 2010, were told their wish to be parents would remain unrealized. As a result they fostered two teenage girls "for a couple of years to give something back". Feeling unwell, 49-year-old Anthea visited her doctor who suspected the onset of menopause. "Peter was devastated," Anthea said. "He bought a pregnancy test ... he picked it." A positive result had Peter "jumping around and yahooing" while Anthea admitted to feeling fearful. 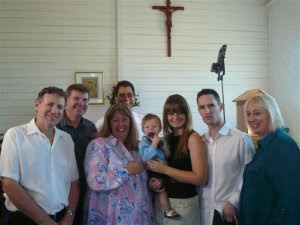 Nicholas Byrnes, who marked his first birthday on Friday (June 15), was baptized in Upper Coomera parish on May 12 amid tears of relief and celebration. -- Unplanned pregnancies happen to women in every season of life: the newly married, the never-married, the empty-nester, the teenager, the overworked mother, the career woman. Yet we rarely talk about how lonely and confusing this experience can be. In Surprise Child, Leslie Leyland Fields, who experienced two unplanned pregnancies in her forties, lyrically weaves her own story with the stories of other women who understand the isolation you face as expectations and plans are turned upside down to make room for a child. Together, these women walk with you month-by-month through the physical and emotional stages of pregnancy, voicing with startling honesty their own anxieties and struggles. Here you will find the companionship and hope you need to journey toward new life. Start reading Surprise Child on your Kindle in under a minute!